Arcades span from the 80s all the way to the new millennium. Most arcades cost .50 cents per play. All games run on quarters and we have a massive reliable change machine on site that accepts $1, $5, $10 and $20 bills. Additionally, Play maintains a skee ball alley, pop-shot basketball games, a regulation size air hockey table and pool table room. Check below for the current game lineup. 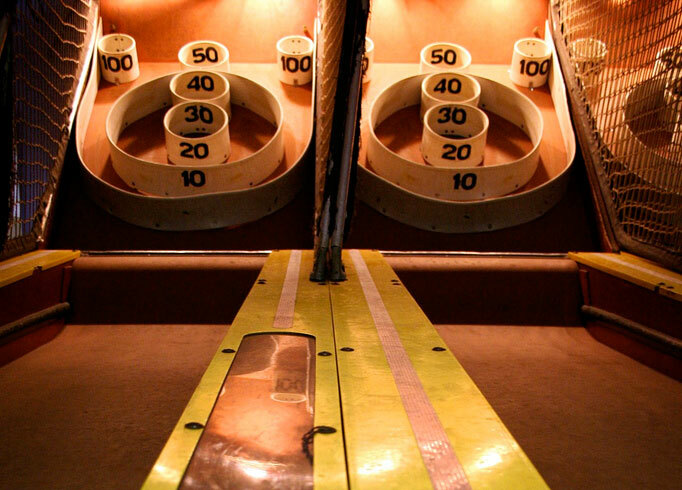 Play does host skee ball and basketball tournaments from time to time and is always available to rent for private functions such as birthday parties, anniversaries, office parties and professional organization competitions. GAMES: MISSLE COMMAND (Atari|1980), GALAGA (Midway|1981), MS. PAC-MAN (Midway|1981), TRON (Midway|1982), TIME PILOT (Konami|1982), TETRIS (Atari|1984), 1943 (Capcom|1987), NBA JAMS (Midway|1993), MORTAL KOMBAT (Midway|1992), TEKKEN (Namco|1994), CRUIS'N USA (Nintendo|1994), THE JURASSIC PARK (Sega|1994), HIGH ROLLER CASINO PINBALL (Stern|2001), TARGET TERROR (Raw Thrills|2004), TARGET TOSS PRO: BAGS (Incredible Technologies|2008), 2 MINUTE DRILL (ICE|2011), GOLDEN TEE (Incredible Technologies|2015), BIG BUCK HUNTER - DUCK DYNASTY HD (Play Mechanix|2016), TERMINATOR SALVATION (Play Mechanix|2010), KNOCK-OFF SHUFFLEBOARD (Arachnid|2015) and more!